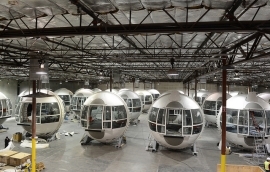 L: In 2014, 28 cabins, each weighing 44,000 pounds and measuring 22 feet in diameter, await delivery from a nearby location in Las Vegas to High Roller where they would eventually become part of the world’s tallest observation wheel. R: Current day photo of High Roller at The LINQ Promenade. Towering at 550 feet in the air, High Roller is the iconic engineering marvel that forever changed the Las Vegas skyline. On Sunday, March 31, High Roller at The LINQ Promenade, the world’s tallest observation celebrates its fifth birthday. To celebrate, birthday special offers will begin on Friday, March 29 and will be available until the end of April. Las Vegas is a place of superlatives, home to some of the brightest lights and largest hotels. When a new attraction is added, it can easily fade into the 24-hour action and activity that defines the city. The addition of High Roller in 2014 was far more than just another attraction, however, and its arrival made an indelible impact on the Las Vegas Strip. In fact, this striking observation wheel did the opposite, permanently altering the Las Vegas skyline and creating a brand-new, bird’s-eye view of the city appreciated by millions of visitors from around the world. 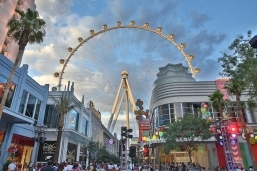 Anchoring Caesars Entertainment’s open-air, pedestrian-friendly destination The LINQ Promenade, High Roller is a 21st-century architectural achievement. This eye-catching attraction is visible from miles away, as well as an iconic monument noted for its impressive craftsmanship, groundbreaking engineering elements and innovative development team that turned vision into reality. The High Roller Wheelhouse will be adorned with birthday décor including balloons and streamers throughout the weekend. As for the wheel itself, five cabins will be decorated for its momentous birthday, filled with large-scale games for guests to play, including Connect Four and Jenga, as a way for riders of all ages to be entertained and play during the 30-minute rotation. “High Roller Commemorative Book,” the official glossy souvenir book chronicling the High Roller’s creation and construction. Rock-N-ROLLER* fifth birthday cocktail inside The Sky Lounge. The drink will feature apple pucker, blue Curaçao and frozen margarita mix. Commemorative photo, complete with available birthday props in the booth area. During the High Roller’s birthday weekend (March 29 through March 31), youth tickets (7-17) will be $5 per person and free for guests six and under. To book these offers, click here for more information. The wheel is 550 feet tall, which is the equivalent 37 giraffes stacked on top of each other. The wheel utilizes 2,000 LED lights displaying thousands of colors, which are choreographed to music nightly during the “Lights at The LINQ” show. These lights also enable the High Roller to be lit in thematic colors to celebrate every special occasion and holiday. The wheel completes a full rotation in approximately 30 minutes, allowing guests to enjoy 360-degree views. The wheel structure has 112 cables. Crews used 7.2 million pounds of steel to construct the wheel. Fabrication of the wheel began in late 2011 with components fabricated and flown in from around the world including China, Japan, France, Sweden, Italy, Netherlands and Germany, as well as Colorado, California and Las Vegas. Each one of the 28 High Roller cabins can hold up to 40 people and 1,120 people can simultaneously ride the High Roller. The wheel structure boasts 7.2 million pounds of steel and is reinforced by 112 cables measuring nearly 4.8 miles when laid out end-to-end. Each cabin weighs 44,000 pounds and measures 22 feet in diameter. The wheel has rotated 63,030 times. There have been 450 weddings, 55 proposals and 10 gender reveals. Feb. 29, 2012: Ground breaks on the construction for the High Roller. Oct. 12, 2012: Erection of the wheel structure begins. March 15, 2013: The hub and spindle of the wheel is complete. July 5, 2013: The first section of the rim is installed. Sept. 9, 2013: The 28th and final piece of the High Roller’s rim is installed. Nov. 6, 2013: The first of the 28 cabins is attached to the High Roller rim. Dec. 3, 2013: The final cabin is attached to the High Roller rim. Feb. 28, 2014: High Roller officially lights up the Las Vegas skyline. March 31, 2014: High Roller welcomes its first ticketed passengers. July 14, 2016: Yoga in the Sky is launched. Aug. 24, 2016: Chocolate Tastings with Ethel M Chocolates is launched, making it the only experience of its kind in North America. Nov. 1, 2016: Lights at The LINQ begins its nightly run with a choreographed light show. Nov. 6, 2018: FLY LINQ opens, becoming the first zipline on the Las Vegas Strip. March 29 – 31, 2019: High Roller to celebrate its fifth birthday. *For guests wishing to purchase the special fifth birthday cocktail, Rock-N-ROLLER, available inside The Sky Lounge, the price is $10. The LINQ Promenade is the world-renowned, award-winning open-air district featuring more than 30 unique entertainment, retail and dining experiences with more to open in 2019. The LINQ Promenade also plays host to a variety of special events, festivals and parades throughout the year. Home to High Roller, the world’s tallest observation wheel, and FLY LINQ, the only zipline on the Las Vegas strip, The LINQ Promenade is now the center for world-class attractions. High Roller quickly emerged as an instantly recognizable part of the already-iconic Las Vegas skyline and consistently ranks as one of the best, “must see” attractions by media outlets and websites around the world, ranging from Travel + Leisure to USA Today and Trip Advisor. The wheel’s 28 glass-enclosed cabins feature an interactive 30-minute experience 550 feet in the air that includes video and music that fades away to unveil spectacular views. The sky is the limit for in-cabin experiences such as the popular Happy Half Hour (an exclusive open bar for guests 21 and over); Chocolate Tasting with Ethel M Chocolates and Yoga in the Sky. The brand-new FLY LINQ provides unparalleled views and features 10 side-by-side ziplines capable of simultaneously launching all riders from a 114-foot-tall launch tower to travel 1,121 feet through The LINQ Promenade at speeds up to 35 MPH. For more information, go to TheLINQ.com. Find @LINQPromenade on Facebook and follow on Twitter and Instagram.